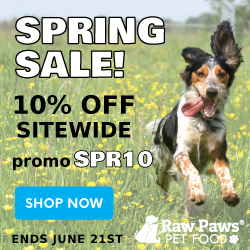 Introduce Raw to Your Dog’s Diet With Wellness® CORE® RawRev™! The post is sponsored by Wellness. All opinions are those of Dog Mom Days. While raw food diets are all the rage, kibble still offers an endless amount of health benefits for dogs. Although feeding raw food to dogs is popular, it can be dangerous if not made properly. I personally don’t have the time, energy or expertise to even attempt to feed my dogs raw, so I want to leave it to the pros. I also prefer feeding my dogs kibble because it has all of the necessary vitamins and nutrients to ensure my dogs are eating a balanced diet. But what if I want the best of both worlds? Wellness® CORE® is now offering RawRev™, a mixture of your dog’s favorite grain-free kibble with 100% raw meat pieces! Wellness CORE RawRev has everything a pet parent could want in a savory meal for our well-deserving pups. This post is sponsored by Natural Balance, and the BlogPaws Professional Pet Blogger Network. I am being compensated for helping spread the word about Natural Balance Wild Pursuit, but Dog Mom Days only shares information we feel is relevant to our readers. Natural Balance is not responsible for the content of this article. Think small dogs can’t have a wild side? Think again! Khloee and Wynston love being active, especially when it means participating in outdoor activities. With cooler weather finally upon us, it’s now hiking season in Arizona. Busy dogs who love the outdoors deserve a food that is going to feed their inner ancestral cravings! Natural Balance® has introduced their new Wild Pursuit™ dry and wet food, which is grain-free and high protein. It’s a great choice for pet parents looking for a nutritious food that offers a balanced diet for their active furry friends.